Experts from all over the world gathered in Bergen for three days on climate change adaptation - or risk management, a better term regarding speakers at the conference. A long list of presentations and posters from a multidiciplinary research fiels reveals a huge amount of knowledge on climate adaptation and climate services, making it hard for the participants to choose among the parallell sessions. Find all abstracts from the conference here. Also Åsa Sjøstrøm at SMHI and Karen O'Brien at UiO stressed the necessarity of correct wording. 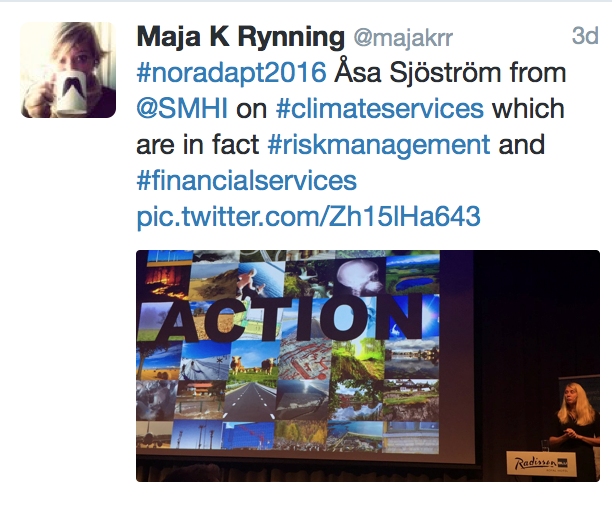 Sjøstrøm talked of calling "climate services" for "financial services" and "adaptation" as "risk management". The twitter hashtagg #noradapt2016 and #nordadapt16 gives more glimpses, citings and useful links from the conference. Karen O'Brien told researchers to step out of the box, see that people lives in many bubbles, and connect to people in the many worlds society contains. – We are talking of climate change and forgetting the hearts. We need to connect to the emotions, O'Brien said. – We have learned that it a simple cascade of knowledge. We know the climate is changing and that we should adapt. Nordic cities can take a lead in all the business opportunities and jobs to me made on climate adaptation. We are not adapting towards a worse society, we are making a better socoiety. The future is bright. What happens before the storm?